A Diamond Select Toys release! There's no bottle Harley Quinn's hammer can't open! 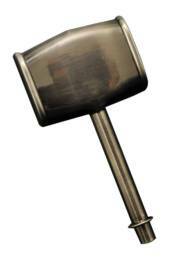 Based on the large mallet wielded by Harley Quinn in Batman: The Animated Series, this sculpted metal bottle opener can remove any bottle cap faster than you can say 'puddin''! A must-have for any Harley Quinn fan Measuring approximately 4 inches long, it comes packaged in a full-color collector slipcase.